Carrying on from our camping in Nannup post we spent a day exploring the local national park on bikes. 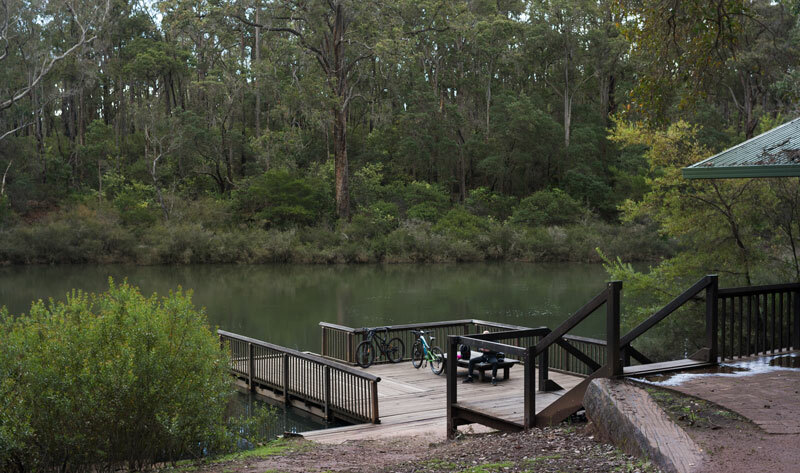 Only a few metres from the main street in Nannup, off road cyclists and hikers have access to 3 trails covering over 40 kilometres through forest and bushland from the towns of Jarrahwood and Nannup. 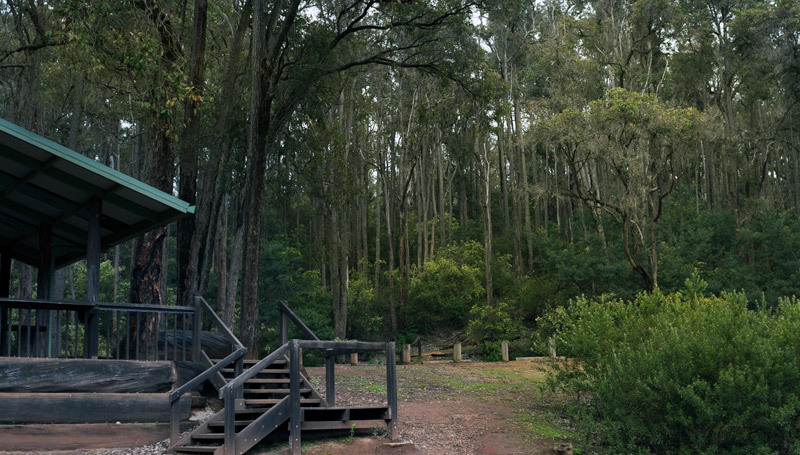 The Munda Biddi continues south from Nannup to Donnelly River, a small holiday village enveloped in beautiful forest and home to tame kangaroos and emus. And if time is your luxury I highly recommend spending a night at Donnellly as well. 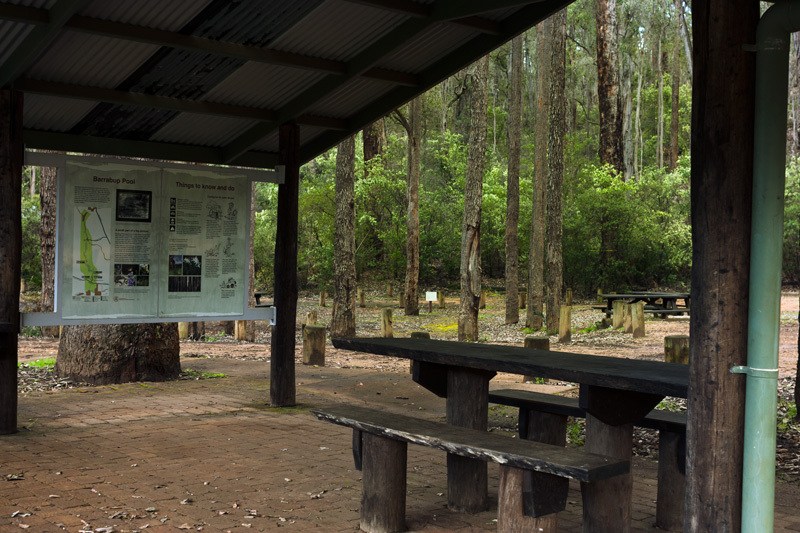 The timber history and picturesque spots in St John Brook Conservation Park is a real treat for any traveller along the trail. Visit during the week and you may just have sections all to yourself. 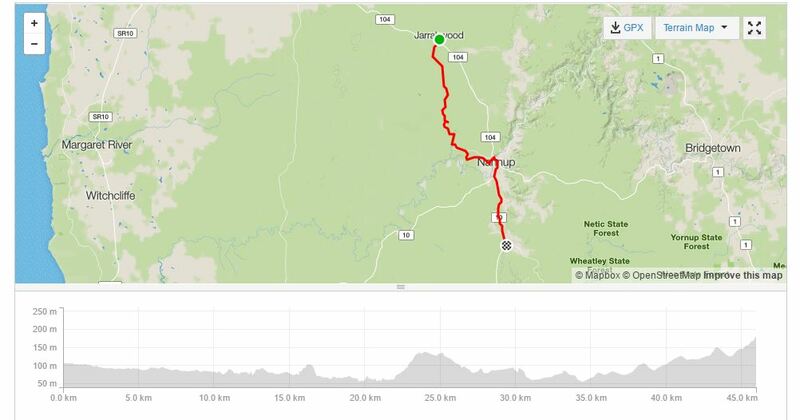 Route: Jarrahwood to Nannup, and then onto our campsite at Nannup Lavender Farm. 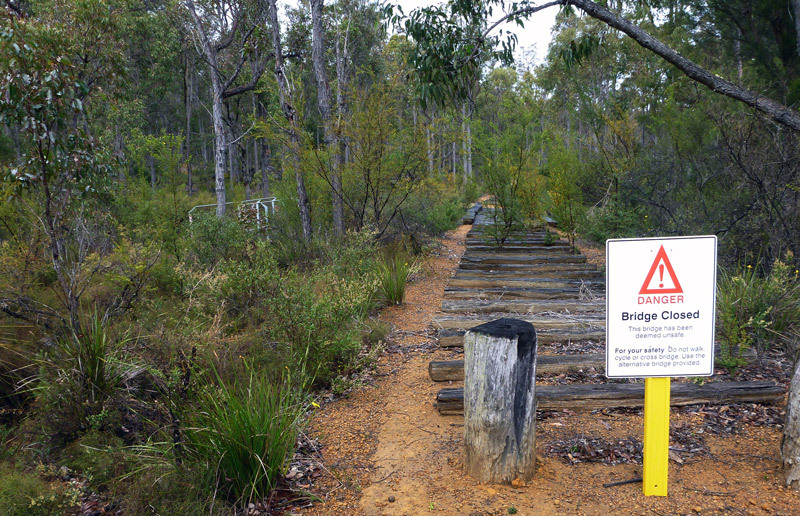 Travelling along the Munda Biddi, Sidings and Old Timberline Trails. 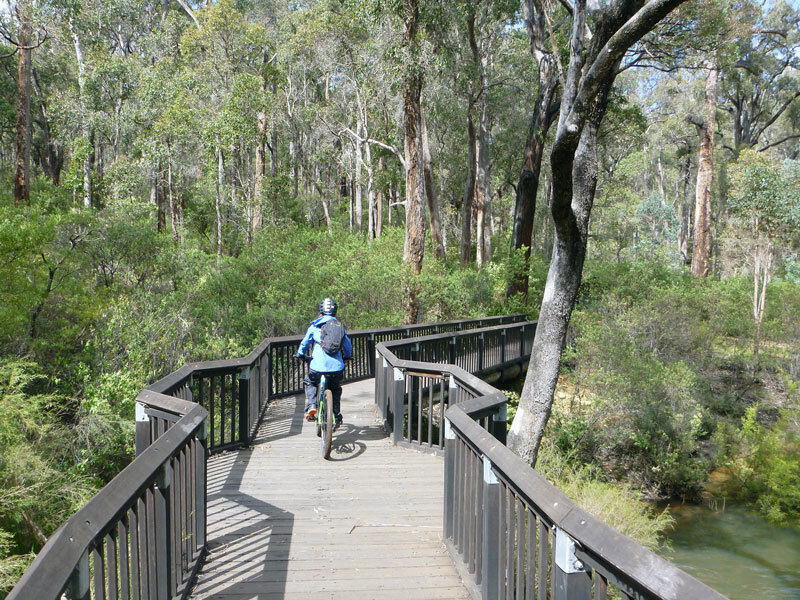 The Sidings rail trail (26km) extends from Nannup to Jarrahwood. The Munda Biddi also passes along this same trail. 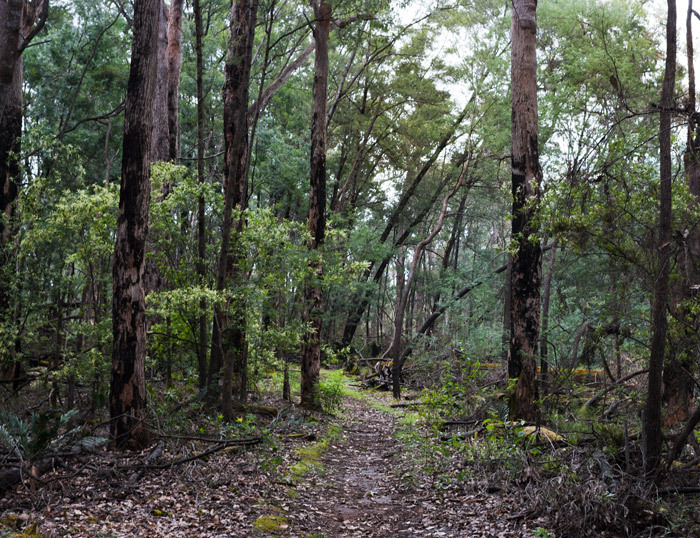 The Old Timberline trail (20km one way) begins and ends from Nannup to Cambray Siding passing through St John Brook Conservation Park. All trails are suitable for hikers and off road cycling. No dogs are allowed in National Parks. We begin our cycle from the trail marker on Vasse Highway in Jarrahwood, easily identifiable by the obviously placed Munda Biddi sign. The sky is grey and it’s raining as we unload the bikes from the car. From experience, the rain will stop and it doesn’t bother us too much because the waterproof pants and jackets are keeping us both dry. Sometime in the early 1900s Jarrahwood was a thriving mill town, and similar to other mill towns in the south west, the majority of people moved away when operations ceased. 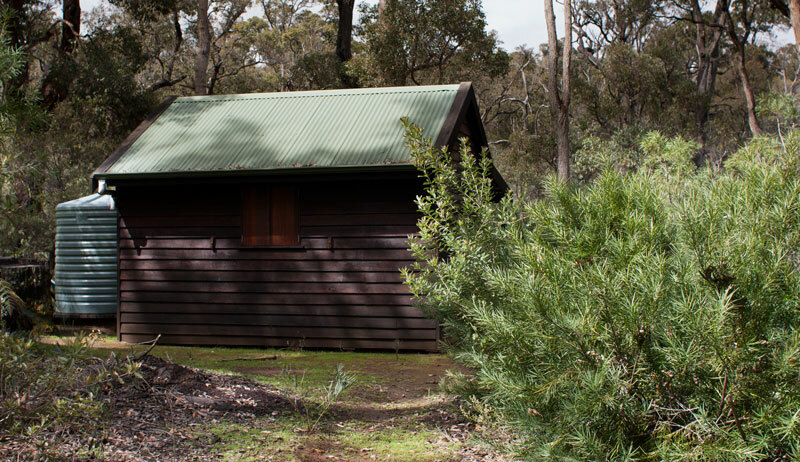 There is a Munda Biddi overnight hut in Jarrahwood on the opposite side of Vasse Highway and in the same location you’ll find a handful of original workers cottages. The Busselton Mail quoted a population of 23 back in 2012, so it’s a small town in comparison to Nannup these days. The dual trail (Sidings trail and Munda Biddi) traces a railway line abandoned long ago. And its probably because of the semi remoteness of the trail that we come across remnants of railway sleepers scattered to the side of the trail and two small sections of rail formation. Heavy steam trains transported jarrah wood from bush sites to Busselton. I find steam trains fascinatingly scary machines. The size and power of these locomotives is incredible. Men would stay up all night stoking the fire. If you’re interested in steam trains may I recommend travelling further south to Pemberton where there are a couple nearby to the mountain bike park. Stand next to one and you’ll know what I mean. It’s a pleasurable cycle through forest made even more captivating when we pass over a couple of bridges and through straight corridors of trees. No amount of trail building can create the authenticity that this first section offers. 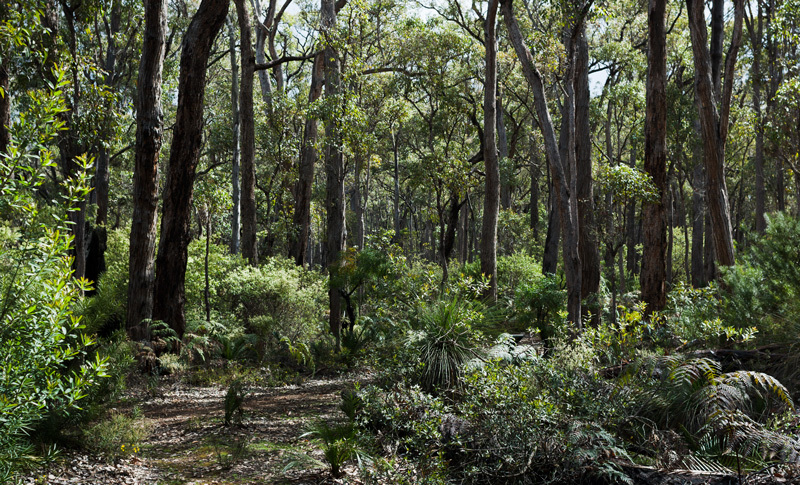 The forest is mostly Jarrah trees, a common eucalyptus in the south west area. The gradient from Jarrahwood to Cambray Siding is easy compact gravel with a slight downhill trend. 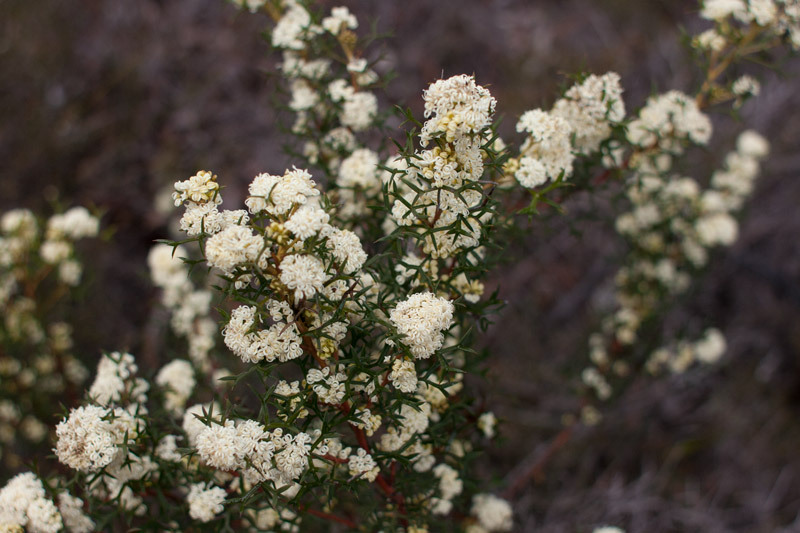 The south west is easily one of the best spots in Western Australia to see wildflowers in spring, however timing is hit and miss depending on rains and warm temperatures. 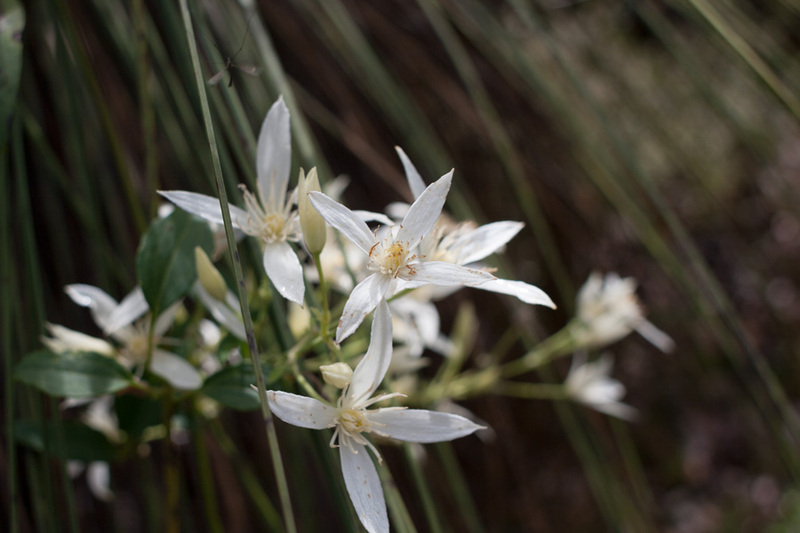 Some are in blossom and even on the trail which indicates this area is not heavily frequented. I am chasing the lone wildflower shrub or plant because the detail up close is fascinating to capture on the camera. 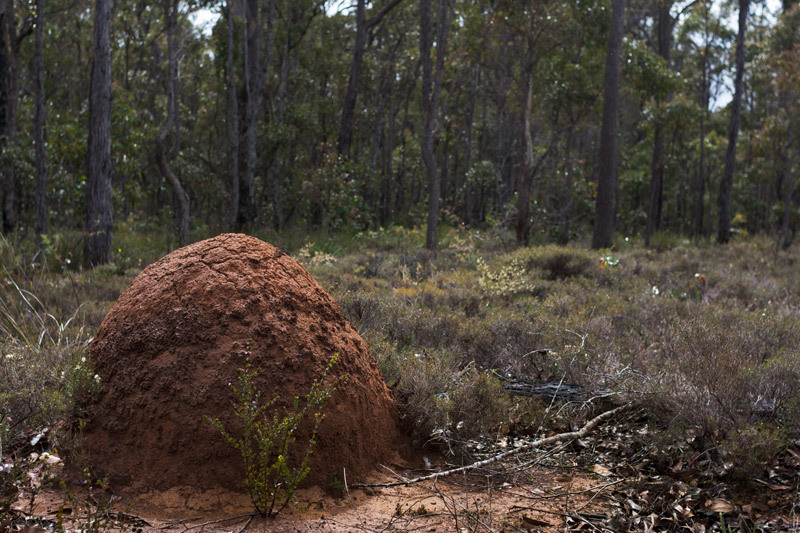 The termite mounds (I think they are?) we come across are quite large and I wonder if the echidna is found in this part of Western Australia? The recent rains create a nice photo of this Patersonia umbrosa var. xanthina. 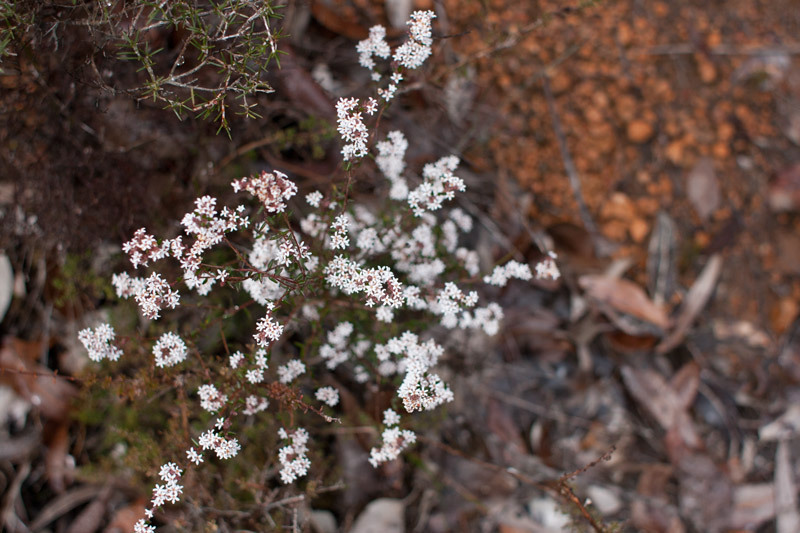 This wildflower is found in the Jarrah forests from Perth to Deep River north of Walpole. 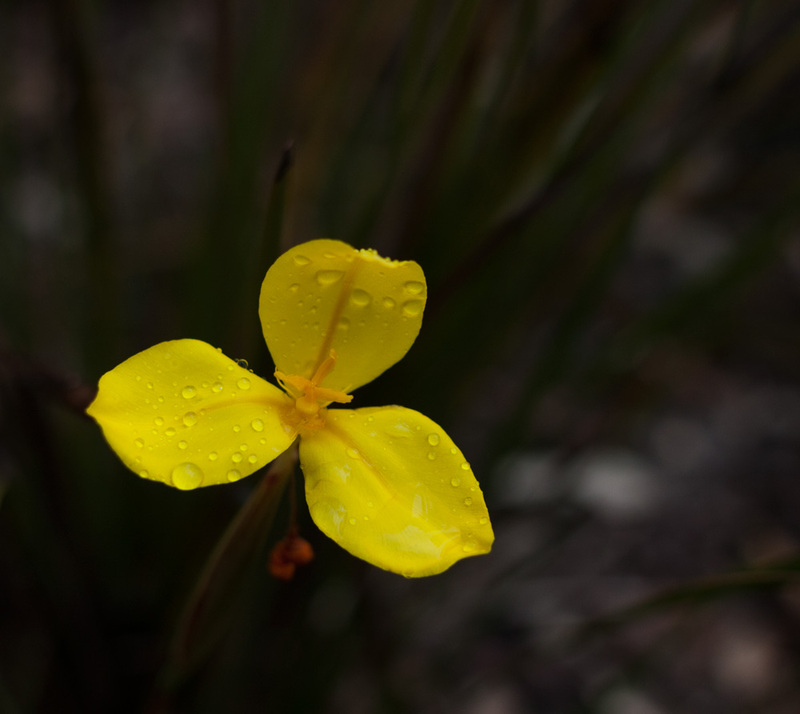 According to the book Wildflowers of Southern Western Australia the blue coloured patersonia is more common to spot, so it was nice to come across the yellow flower on the trail. 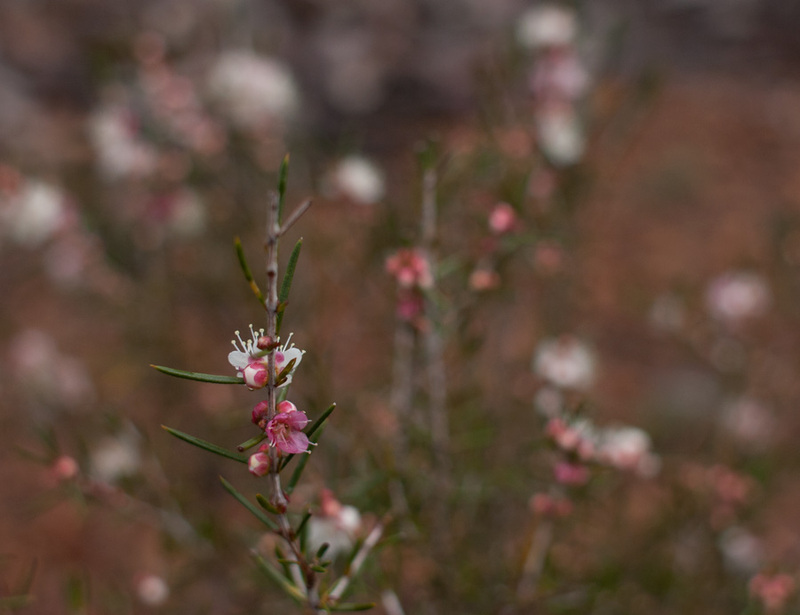 The hypocalymma shrub below is just beginning to grow and I think its an angustifolium as the description in my wildflower book describes this flower to open white and mature deep pink or in some cases white or cream. Very cool! The further we cycle into the forest we observe the trees begin to soar to greater heights. While I don’t think it’s virgin forest given the area was notable for timber milling, time has certainly been given for nature to replenish. We exit the trail to an opening and a basic camp ground at Cambray Siding. Being Friday ahead of the long weekend it’s occupied by large tents and trail bikes. The Munda Biddi sign has been knocked down in this section. 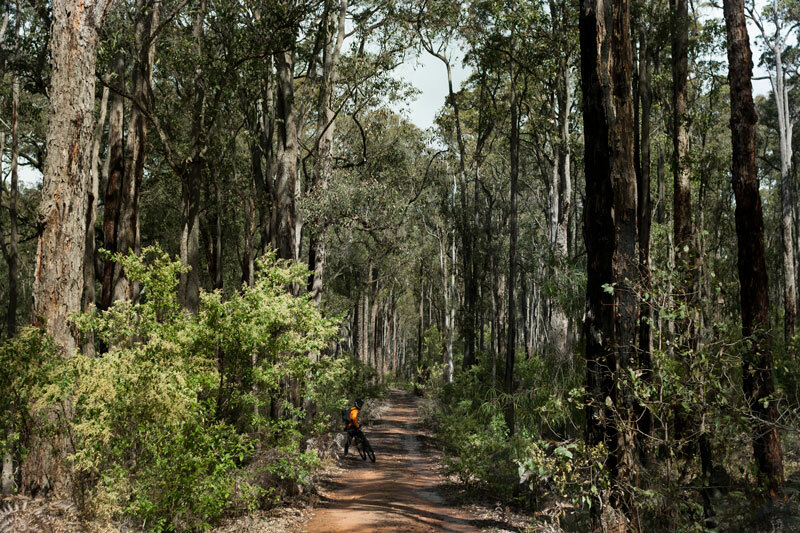 We pedal straight entering the forest and see a car travelling ahead of us on the Munda Biddi. This is not really condoned as there is a perfectly good gravel track in this section running alongside the Munda Biddi. 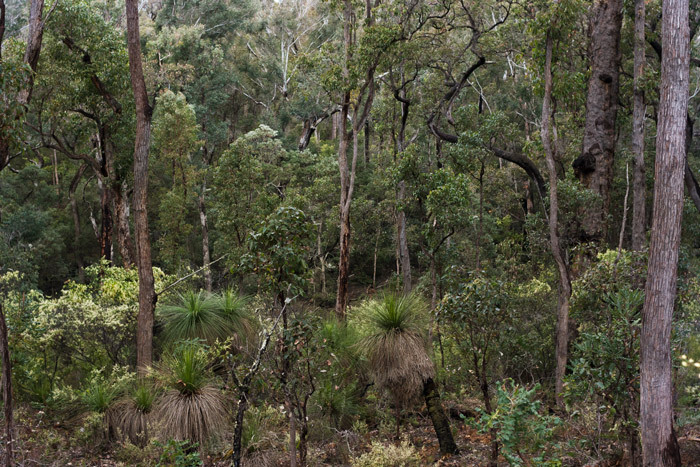 Aside from the potential spread of dieback disease and collision accidents, the Munda Biddi also acts as a natural corridor for the wildlife. We reach the entry to the Old Timberline Trail and we’re a little confused at the appearance of the fork roads. My instinct that the Regalia Street sign has been swivelled around is correct and although I could be quick to blame this as intentional, in more of a laughable way, perhaps someone was leaning on the sign minding their own business, eating a banana and it swivelled around. They couldn’t remember which direction it was in the first place and they became lost. As always a good sense of direction and map reading skills helps. We follow the path straight (to the left of the trail sign log). The Old Timberline Trail marker is a white triangle with a black axe and it’s visible on ad hoc posts or a tree like in the photo below. We find the trail is fairly well sign posted however I would always recommend a map or satellite GPS system in the forest because a wireless signal is quite often useless. 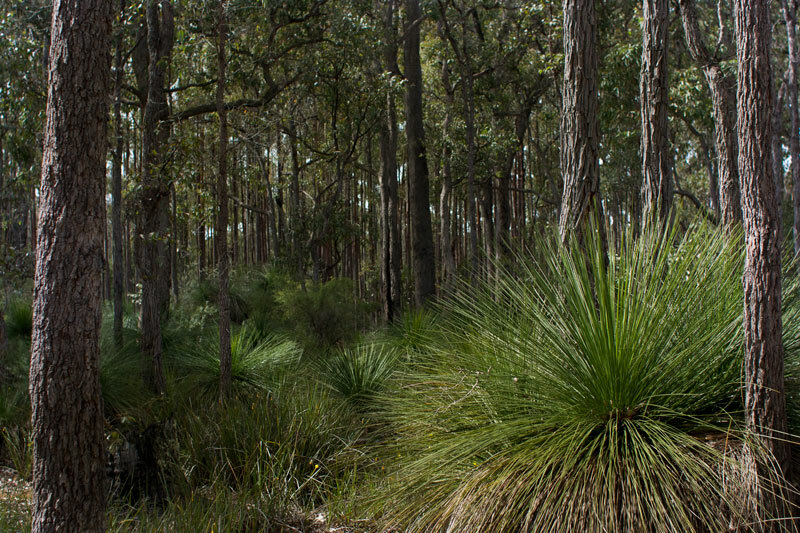 The trail meanders through St John Brook Conservation Park and the scenery closes in to a dense forest where the Jarrah trees are substantially taller and older in appearance. To the left of the trail, the terrain falls into a river valley with a stunning layered storey of forest and we follow the direction of St John Brook. Although we can’t see it just yet, we hear the trickling sounds and bird life that the water system attracts. We talk about the poor Nannup Tiger (Thylacine), once one of Australia’s largest carnivorous marsupials. Questions of its extinction have been asked when a number of unconfirmed sightings surfaced, including one as late as 1990. A legend, or does it still roam the forest? There are some things you encounter in the forest, that should stay in the forest……. The beautiful wildflowers slow us down as I stop to appreciate them leaving Derek pedalling ahead until he turns around and sees I’m no longer around. Normally I keep the old 400D EOS camera in my backpack however I clip a pouch to the front straps for better access to the camera whilst cycling the trail. While there are no scenes like that of a canola field, there is better here, there are obscure lone wildflowers. And hikers will be at a better advantage in spotting them. We detour from the trail to break at a small basic camp site called Sleeper Hewer’s Camp. It’s an enchanting little section of the forest and would definitely draw us back to the trail for an overnight stop, perhaps for a hike instead of cycling. I spot this wildflower, a Clematis pubescens, growing with another plant behind the hut. Isn’t it beautiful? Leaving the hut, we cycle into a dead end which turns out to be a viewing vantage point. Unfortunately we didn’t get to see much of it as the rain began to fall, immediately followed by small round hail balls. We laugh at the experience of being hailed on in the forest. We’re not cold and the wet weather gear is still keeping us perfectly dry. My feet are not yet wet so I am very happy and the thermal socks are keeping me warm. As we climb a few metres higher we see the offending black cloud in the far distance. Red tail forest black cockatoos are known to visit the area and being noisy and extremely entertaining birds they are very easy to spot, however we don’t encounter any on the trail today. We reach an opening of the brook, a natural water pool called Barrabup pool. Here we cross to the other side of the brook over a wood bridge. 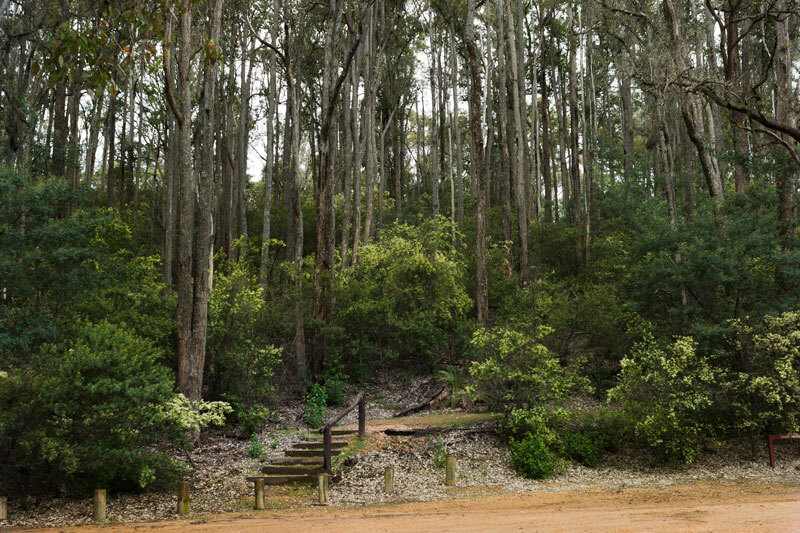 Barrabup was the location of the timber mill, processing local Jarrah trees for wood. Nowadays it’s a scenic location for picnics and camping trips. The area even on a dismal kind of day is captivating and in that sense we’re lucky to have the whole place to ourselves so I can’t complain. We break on the decking area. Eating some banana olive oil cake (aka cyclists cake), more bananas and chocolate. We’re hungry and the food is really satisfying. This area seems frozen in time and I half expect the Griswold family to pull up to the wood shelter. It’s refreshing not be distracted by bright colours but rather the surrounding forest. I like the rustic wood construction shelter against the forest backdrop, no doubt the materials are from the local area. 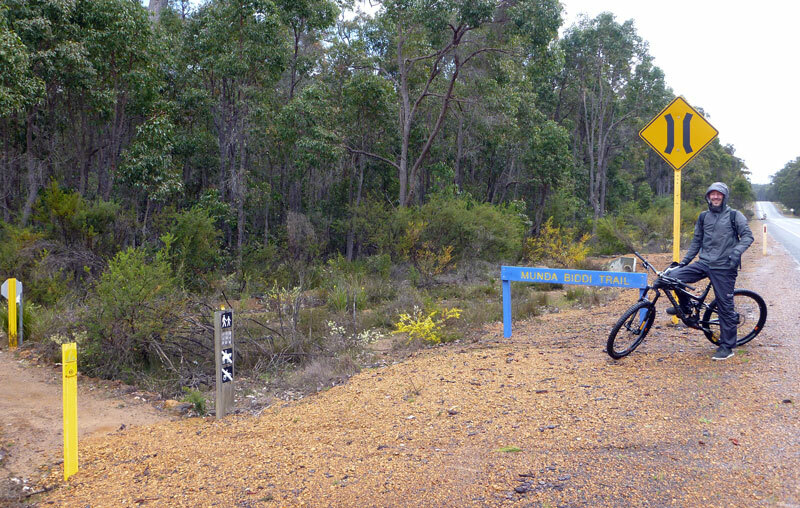 We leave the beauty of Barrabup Pool and leisurely enjoy a snaking section of single track. We reach a clearing where there is a sole campervan set up in the designated camping area. We follow the sign post to Workers Pool thinking the trail continues however we are met by a dead end for the bikes. An equally beautiful one with a small pool and rocky outcrop on the bank. 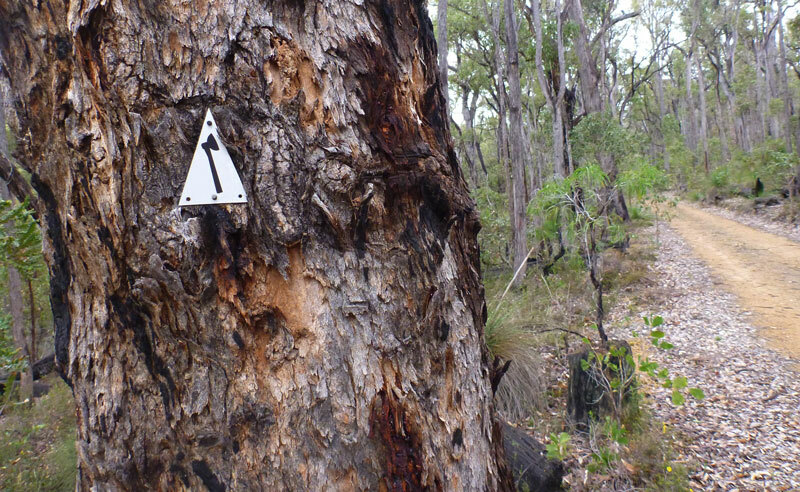 We back track and cross the clearing, passing the toilets to the opposite side where we spot a wood sign titled Nannup. There is no Old Timberline Trail marker visible and the trail is obstructed by fallen trees but we are fairly sure this is the trail according to the arrow on the Garmin GPS. So we mount the bikes on our shoulders and climb over the fallen trees before we spot a marker. Nothing too challenging. The surroundings change to moss growing up tree trunks and a littered water logged floor. It’s been an excellent winter for some parts of Western Australia. The river table is high and this is evident through this section as we encounter washed out parts of the trail and large puddles. Strange enough in this section several trees have been axed and left over the path. Black grey sand appears and here we stick to cycling the edge of the trail avoiding the tyres from sinking in the boggy sections. The bird life can be seen as we cycle and I see a small bird with a red chest which I’ve never encountered before. It’s too fast for the camera. We cross Brook Rd leaving the flowing St John Brook. The trail climbs 75 metres, the steepest for the day’s journey. We then cross Mowen Rd and we find the markers aren’t as common however there is sufficient ones to lead us in the right direction. The trail remains in the forest as it follows alongside the car road. From Workers Pool, this section is definitely the lesser travelled with debris and fallen trees on the trail. I wouldn’t say it’s difficult however it does require a great deal of focus as we navigate the bikes. 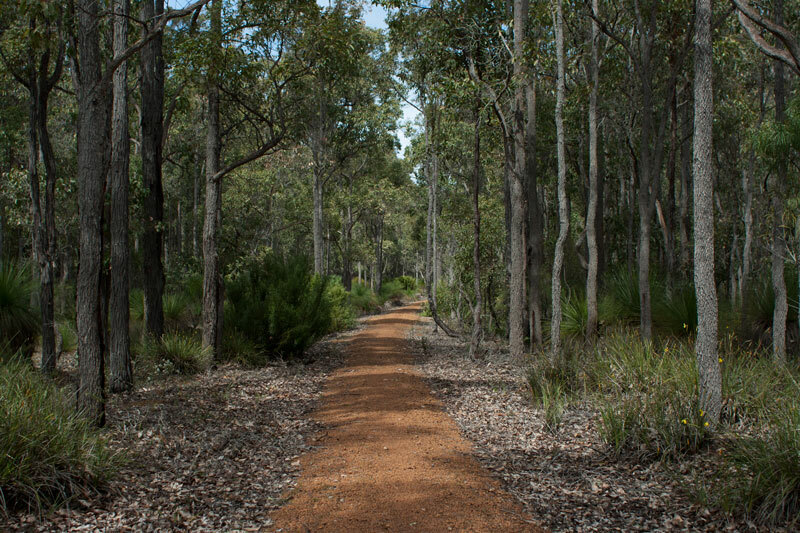 To be honest I prefer travelling on untouched trails however if you are looking for a quicker ride I think the Munda Biddi on the other side is fairly straight in path looking at the map, but do not take my word as I haven’t cycled it just yet. We don’t stop as much on this section as the afternoon is disappearing and the light fading. We spot a few kangaroos and it’s a brief face off before they hastily disappear behind trees. As we join up to the Munda Biddi approaching Nannup’s Foreshore Park we pass the biggest cow I have ever seen sitting down in a paddock. 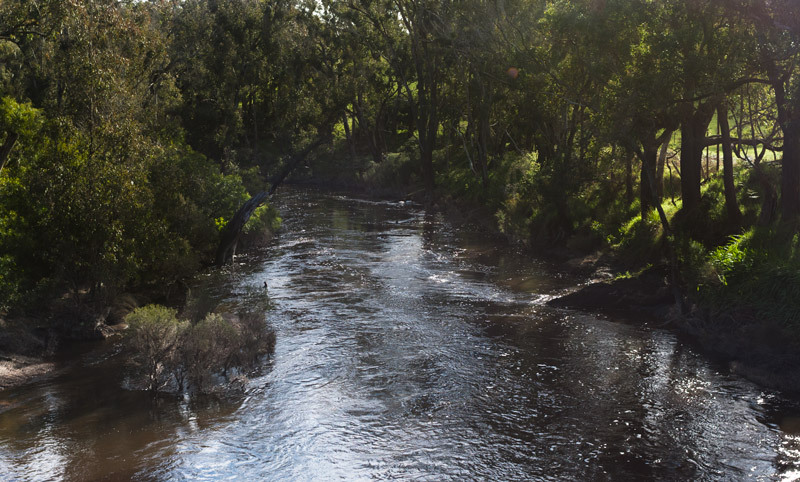 We then cross the last of many bridges over the Blackwood River, the longest flowing river in Western Australia. While we left St Johns Brook some time ago it does eventually meet the Blackwood River. The appearance of the sun is a nice ending chapter to the days cycle in the forest under mostly grey skies. 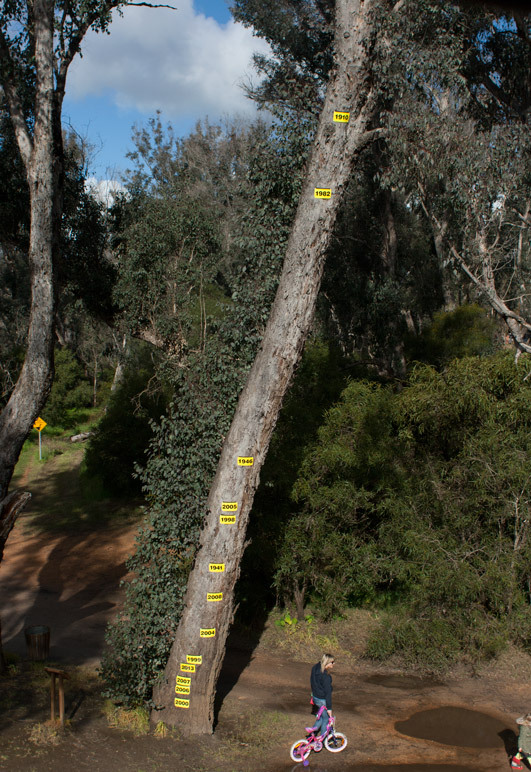 On our left is the flood line tree, displaying the levels the river has breached over the years. It’s almost unbelievable to look at the highest marker in 1910. The next one is 1982. We cycle through the main strip of Nannup stopping off at the petrol station to inflate the tyres. A kid walks up to us and starts chatting about mountain bikes. He’s keenly interested in where we have been and tells us about a few local spots for jumps and down hill runs. It’s 4pm and with some shining determination we decide to cycle back to the Nannup Lavender farm where we are staying for the night, and although we question this choice 30 minutes later somewhere on Vasse Highway in rain and strong winds that block the downhill runs, we do experience some entertainment along the way. Cows, these curious animals. We pass paddocks and they run towards us and along the farm line until they can follow us no more. We see emus run and this is funny to watch. We feel closer to the rolling hills we’ve only seen through the car window. These encounters keep morale high as the sun begins to set and my feet are soaked. We were ecstatic to reach the Nannup Lavender Farm camp ground and while Derek went straight for the beer, I went straight to the hot shower followed by a glass of red. We lay in the tent for a few hours unwinding from the day and when the stars appeared in the night sky we jumped out of the tent and cooked up one of the prepackaged camping packs – lamb risotto. We fell asleep to the sounds of pitter patter on the tent. Wow what a ride, even in less than idyllic weather conditions the trail impressed and was engaging during the entire journey. 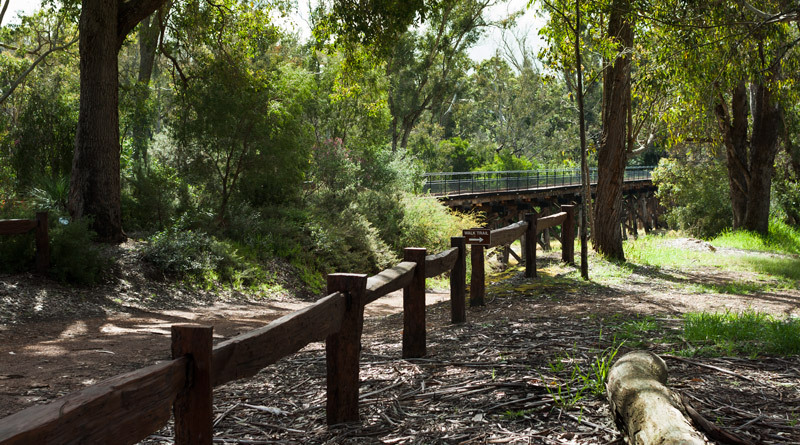 Personally we enjoyed the seclusion of the trail and mellow gradient of riding.The single track from Barrabup Pool is something we are well used to cycling having frequented the Kalamunda trails. It was about 12km to the farm from the town centre and not an overly difficult ride. We would have liked to have breaked in Nannup for some food, however many unexpected beautiful distractions along the trail did extend the journey’s duration and we basically ran out of time having started the ride later in the day. 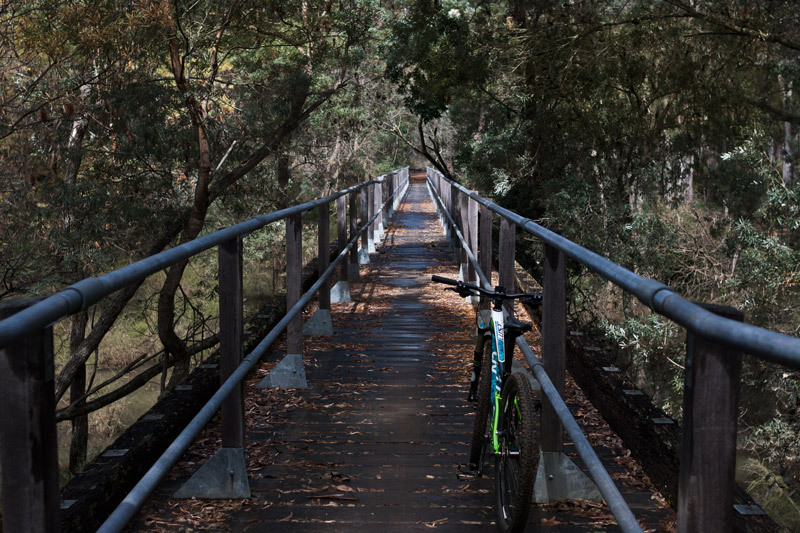 It’s possible to leave from Nannup and complete a combination of the Sidings/Munda Biddi Trail and Old Timberline Trail in a loop returning to Nannup. Wash the bikes before and after the journey to prevent spreading of dieback. Same goes for shoes too. If returning to farm accommodation, do not venture into the agriculture areas. 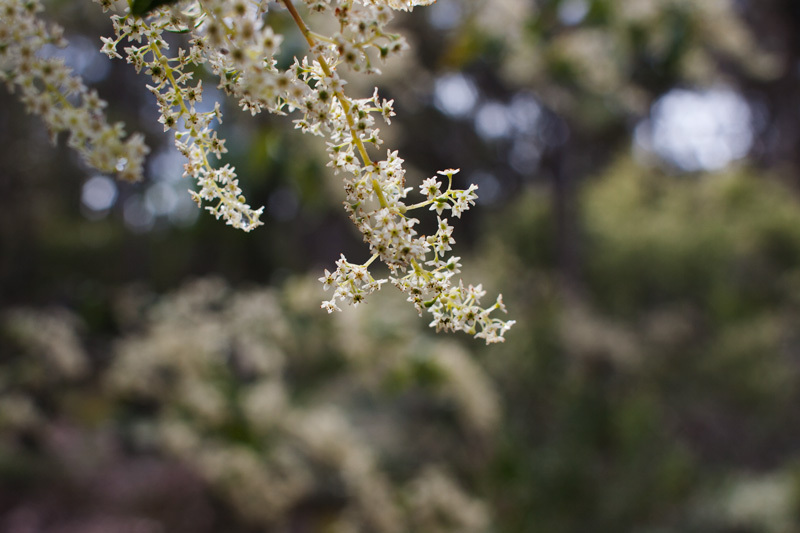 Have you seen our other posts on Nannup? Gorgeous! I would love to check out Barrabup Pool one day too. You should! There is a beautiful walking trail as well as camp ground at the pool. I’d like to swim when its a little warmer.